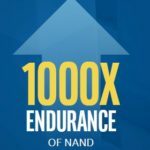 The Memory Guy, as a regular reader of The SSD Guy’s posts, found an interesting one that compares the endurance of Optane SSDs against that of NAND flash SSDs. 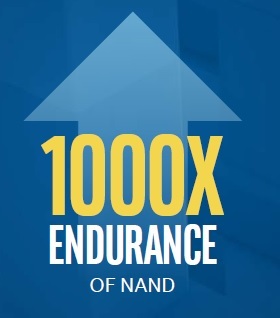 Perhaps this could provide some insight into the Intel & Micron claim that 3D XPoint Memory’s endurance is 1,000 times that of standard NAND flash, shown in the graphic to the left. The SSD Guy post converts several different measures of SSD endurance against each other: TBW, DWPD, and GB/Day. Definitions of these terms can be found in that post. It occurred to me that any of these can be used to roughly gauge the relative endurance of 3D XPoint Memory against that of NAND flash. Take DWPD for example: Drive Writes per Day. Not only is this a measure of how many times that an SSD can be over-written every day, but it’s also an indication of the number of times that each memory cell can be overwritten. If you know this, and if you know how long the drive is expected to last (its warranty period) then you can get an idea of how many erase/write cycles the underlying memory media should be able to endure: Simply multiply this number times the drive’s warrantied lifetime in days. Of course, this calculation is far too simplistic. SSD designers use a number of tricks (detailed in a series of blog posts The SSD Guy wrote some time back) to make an SSD last longer than its underlying media would normally support. One of these is overprovisioning, where the SSD contains spare media that is not accessible by the user to help manage wear. Others involve storing data in a DRAM buffer and postponing writing it to the NAND in the hope that that address will be overwritten before the DRAM’s contents are pushed off into the NAND flash. With the admission of these failings, let’s look at what we get when we apply the simple formula to the endurance figures from The SSD Guy’s post on endurance. The table below, taken from The SSD Guy, compares three measures of endurance for a number of randomly-chosen Intel NAND SSDs against Intel’s recently-announced 3D XPoint-based Optane SSDs. It’s an image of an Excel spreadsheet – the white cells contain numbers found in Intel product specifications and the yellow cells are calculated. All but the bottom three rows are NAND flash-based SSDs. The bottom three, the “Optane” SSDs, are all based on 3D XPoint Memory. What I find interesting in this exercise is that the cell lifetime calculated using this approach is not significantly different between the NAND flash SSDs and the 3D XPoint Optane SSDs. 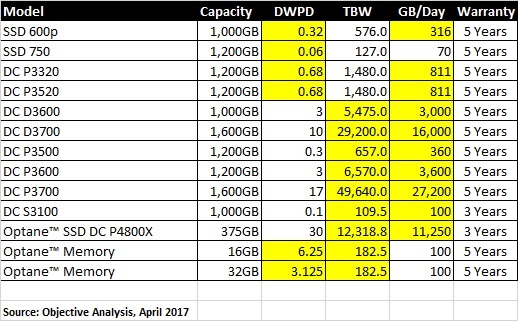 On average the Optane SSDs have better numbers, but the 32,850 W/E figure for the Optane DC P4800X is only marginally superior to the 31,025 W/E figure for the NAND-based DC P3700. The 32GB Optane Memory client SSD offers endurance that is ten times that of the NAND-based client SSDs (on the top two lines). In actuality there is probably a little bit of all three of these at play. It’s early in the life of 3D XPoint and endurance may not be consistently as high as its creators know to be possible. Likewise, since it’s early in the product’s life the optimum wear-leveling algorithms may not be known, and Intel may not want to make promises to its customers that could embarrass the company if something changes. The Memory Guy plans to watch these specifications in the hopes that they will dramatically improve over time. Meanwhile the low numbers provide a clear reason why Intel has chosen to ramp up the Optane SSD well in advance of the memory-channel-based Optane DIMM, which will be the more successful Optane product by a wide margin. The Optane DIMM can be expected to receive a few orders of magnitude higher write loads, and this may not be supported by today’s 3D XPoint technology. The expected outcome of the Optane market, and the reasons that the DIMM will find better acceptance than the SSD, are explained in detail in an Objective Analysis report: A Close Look at the Micron/Intel 3D XPoint Memory. Could it be that the bulk of the endurance claims come from 3D XPoint being bit-addressable (or at least byte-addressable) thus eliminating write-amplification? Good question, Scott. Bit-addressability (and over-write as opposed to erase/write) do eliminate write amplification. Just as a refresher: Quite some time ago Intel introduced the term “Write Amplification” (WA) at an Intel Developer Forum (IDF). If I recall correctly, Intel boasted of having a WA of under 1.5 while the worst they saw in several competing SSDs they evaluated was something like 7. At the extreme they could say that 7 was about an order of magnitude (10X) but that doesn’t line up with their 1,000X claim at the introduction of 3D XPoint. Something else appears to be going on. Hi, I am a university student who is really into memory industry. I really want to know why optane memory 16GB and 32GB have the same TBW (182.5TB). I think if 16GB has 182.5TBW, then 32GB should have 365TBW. As I know, Normally the storage drive which have bigger space they have more TBW than smaller, especially in same architecture. But I don’t understand why they(16GB&32GB) have the same TBW. So 32GB is exactly the half of 16GB’s endurance. Is there any special policy in 32GB? even if the cells in 32GB still alive? After I had curiosity, I searched from the internet, but there’s no article about this. but fortunately I found yours! I really appreciate if I get the answer or assumption from you. In a way it sounds like the endurance may actually be significantly better than specified, but Intel didn’t choose to spend the enormous amount of time and effort required to provide a precise number since the current specification is more than sufficient for the application. This is very similar to the way that NAND flash chip endurance is specified: Since it would be very costly and time-consuming to specify the exact endurance of a chip, NAND suppliers choose a specification that they know all chips will meet even if the chip makers don’t test that parameter. Most NAND flash chips last significantly longer than specified. Why are you going to such great lengths to defend Intel? The x1000 endurance was just a marketing B.S. The suggestion that someone in Intel’s management told the RDT guy’s “don’t sweat it boy’s, 10K P/E is enough” is laughable. Ed, I have to admit that Intel’s position is puzzling, at best. 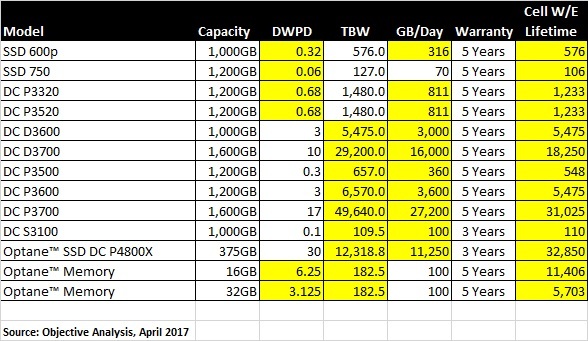 The RDT claims at least provide SOME reason why the TBW is the same for both the 16GB and 32GB drives. I can’t think of a better reason for that.